Comet is a set of techniques which allows web applications to push data to the browser. It is also known as Ajax Push, Reverse Ajax and HTTP push server among others. It is used in web applications to display fluctuating stock prices in real time, in chat applications, collaborative documentation editing and a lot of other applications. Without comet, the only way the browser can get updates from the server is by periodically issuing AJAX calls to check for updates. This technique is not efficient in term of bandwidth and load on the server but has the advantage of being easily implemented. long-polling: the browser issues a request to the server. The server waits until there is a message available to be sent to the client or after a suitable timeout. Then the browser immediately sends a new request to the server to repeat this process. websocket: it allows a browser to open a full duplex communication to the server using a single TCP connection. All the main browsers have this implemented in their latest version. For a good description of those techniques, you can look at the push technology page on wikipedia. Depending on the browser, its version and the network settings (proxy, firewall), some of those techniques might work and some might not. So to overcome this issue, comet frameworks usually implement several techniques. LightStreamer. They have an interesting push model which is a mix of a cache model and publisher/subscriber model. The application writes data to a cache. The client(browser, java application, flash application, …) can get the current value of an element in the cache and listen to its updates. If the client asks for an element in the cache which is not there yet, lightstreamer can try to populate it(from the database or another source) and sends it to the client. CometD. It’s an open source project developed by the Dojo Foundation. It uses the publisher subscriber model to push the data to the clients. 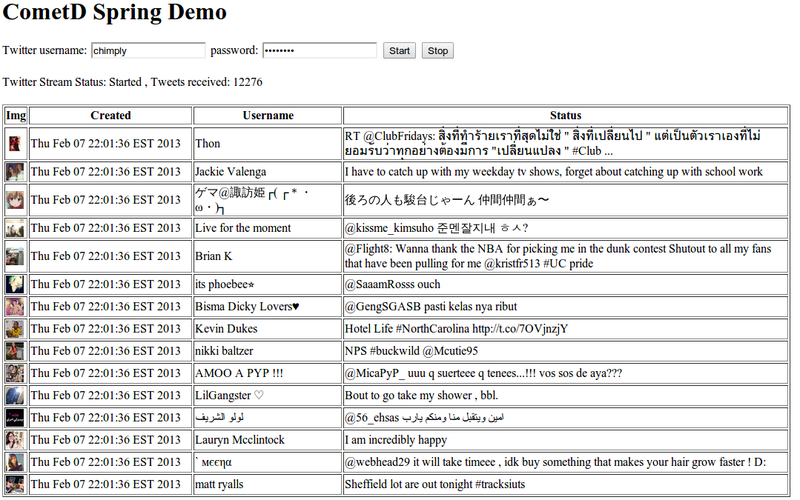 In our tutorial, we are going to get a live stream of twitter statuses, and publish them to a web page using cometD. CometD supports multiple techniques to push data to the browser: websocket, long-polling, and callback-polling.